This one is a favorite in my mother-in-law’s house and is super easy for kids to help make. Serves 2 grown-ups and two young kids. Follow package directions for the puff pastries. While that bakes, warm up the chicken soup. After putting the soup on the stove drain the asparagus and cut into one-inch pieces. Add the asparagus and frozen shrimp to the soup. Heat until shrimp are fully cooked. 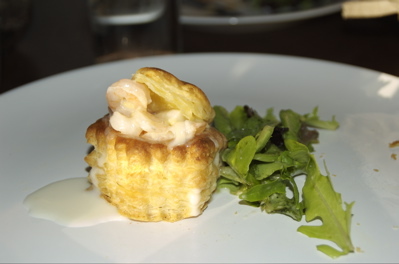 To assemble, just take off the pastry “hat” & fill the pastry container with the shrimp mix. Top off with hat and garnish with a side of salad.